In my last post I outlined the way in which we were launched into the world of legal representation via twitter and got ourselves a solicitor highly recommended by our new caseworker from INQUEST. Charlotte Haworth Hird from Bindmans. Charlotte was very highly recommended. Being completely unfamiliar with any of this new world we wanted no part of, we just held on and ran with it. Before the relationship was officially sealed, Charlotte spent some time on the phone with me, talking through some extremely upsetting and uncomfortable things (autopsy details, potentially delaying LB’s funeral, the enormous costs involved in having legal representation at an inquest and what we could realistically expect to happen). Again, I can’t describe what it’s like to have these sorts of conversations days after your child has died, but Charlotte was sensitive, thorough, kind and comprehensive. We dropped out of touch with her for a couple of weeks then picked up the communication after LB’s do. We arranged to meet her at her offices a few days later. Before the meeting, she emailed about various bits and asked us to send a photo of LB so she could “put a name to a face and see who we are fighting for”. That kind of sealed it for me but you don’t know anything in the world of the completely unfamiliar. We met that first time for about four hours. We were hopelessly late as we pounded up and down Gray’s Inn Road with me getting the office number completely wrong. It was boiling hot and beyond stressful. I’d wanted to scream at everyone on the train from Haddenham where we going and why but of course, you don’t. Charlotte was an oasis of calm. She talked us through excruciating and agonising details and memories and thoughts. With compassion and sensitivity. Since then we’ve largely interacted by email. Typically, very short, two liners from me and essay length responses from her. The kind of emails you need to read a couple of times to grasp all the content but, at the same, emails that contain everything you need to know. Including all the stuff you had no idea you needed to know. I hope very, very few of you are ever in the position of doing what we’re doing. But if you are, a brilliant solicitor you can completely trust is priceless (not only because they costa del fortune). We’re delighted Charlotte just won the ‘Inquests/actions against the state’ award at this year’s Legal Aid Lawyer of the Year Awards. Wow. So deserved. 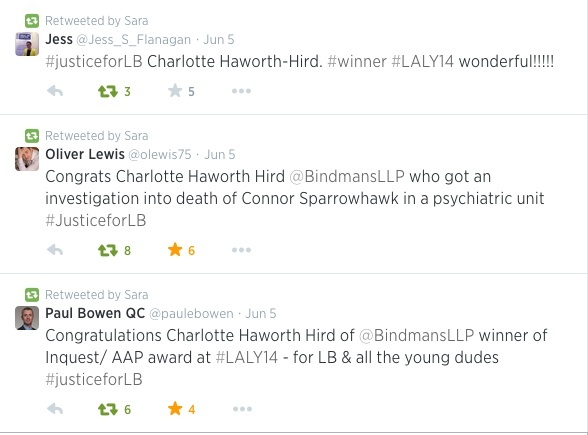 And so blinking brilliant that her remarkable work to try and get justice for LB contributed towards this. I’m pretty sure she’ll cringe her socks off at this post (she most definitely doesn’t do twitter or social media) but Charlotte, from one of your clearly many satisfied (not the right word… Grateful? Desperate? Heartbroken..) punters, you’re fighting the fight in a way that’s restorative, reassuring, heartwarming and bloody exceptional. This entry was posted in Inquest stuff, Laughing boy tales by sarasiobhan. Bookmark the permalink.